DTC’s AEON group of products have been specifically designed for the 4K market. We encode with the more efficient HEVC algorithm, which means we are taking a 12G signal and compressing it to a bitrate that can be managed over an RF link. So what makes this a leading idea in the 4K revolution? For a start, sport continues to drive technical innovation and significant portions of the live sport sector absolutely require the AEON approach to wireless 4K. At AEON’s native 12G you can capture and transmit fantastic pictures. I know what you’re thinking. “What about latency?” which has for many been the hurdle to full 4K UHD (and, in its early days, HD) adoption. Minimising the glass-to-glass delay is crucial in a multi-camera production environment. When the first wireless 4K systems came out just a couple of years ago, the minimum achievable picture delay was two seconds, which for other than research purposes pretty much stalled those systems at the starting gate. We have streamlined that process to get the delay to an astonishing and virtually unnoticeable 66 milliseconds. Latency issue over. Picture quality is determined by the number of bits you can transmit over an RF link and still maintain the link. The more bits that you modulate on an RF signal the more chance you have of breakup. Transmitting fewer bits provides a more robust link, but results in poor picture quality. What DTC did with AEON to get around this problem is to devise a “dual pedestal” approach. Historically we’ve extended a signal over an 8 MHz DVB-T channel. In such a channel, you can have three types of modulation: QPSK, 16-QAM, and 64-QAM, but none have the range and picture quality necessary for most outdoor events. Therefore, instead of trying to fit everything on an 8 MHz channel, we decided to create something called ‘dual pedestal’, which enables us to send up to 42 megabits of data over two 16-QAM DVB-T channels. This was previously unheard of. Theoretically, the maximum that can be sent over a DVB-T 8MHz RF link is 32 MB running at 64-QAM. That provides a decent picture quality but, again, the RF robustness is compromised and only a few metres can be achieved wirelessly, which is unusable for a lot of outdoor sporting events. At 4K, you need more than 22 Mbps, and we understand that true 4K RF quality requires about 32 Mbps of data, which is what high-end sport and entertainment productions should be aiming for, but the only way to do that is through dual-pedestal modulation. Our dual-pedestal modulation technique enables our AEON transmitters to carry quality signals for miles, rather than a few metres. Why? Because DVB-T has 2000 carriers and the performance of DTC’s PRORXD-AEON receiver is unrivalled. There are other modulations that take a dual-pedestal approach, but these modulations generally use less than 500 carriers. That’s fine for ranges of less than a kilometre, but beyond that, 500 carriers aren’t enough to cope with multi-path reflection and you end up with an echo effect, which causes major, unacceptable picture breakup. Because DVB-T has 2000 carriers, AEON has four times the useable symbol rate. 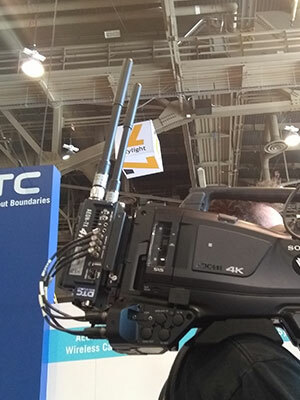 We recently did a wireless test transmission of full 4K over five kilometres at 32 Mbps with no picture breakup. None. In addition to the use of DVB-T dual pedestal, the performance of the DTC PRORXD-AEON receiver is exceptional. This enables higher order modulation to be used giving a larger data rate and therefore better picture quality for any given environment. Because AEON’s RF performance is unparalleled, users are guaranteed reliability, not just because of the system architecture, but because it uses DVB-T modulation that is proven to work over long distances because of the 2000 carriers. The second part of this equation is that, although 4K is a wonderful thing that AEON can do with absolutely no problem, its ultimate benefit is that four separate HD pictures can be reliably sent over a single RF link, in a variety of HD formats, including 720p, 1080i, 1080p…whatever’s required. AEON is a product family. AEON-TX includes everything. We developed the product using HEVC encoding for use with our software-defined radio (SDR) to create a product that doesn’t just do traditional ASI-COFDM, but can also work with IP Mesh systems. It can also transmit COFDM and receive an IP stream back on a different frequency. AEON-CC includes integrated remote camera control capabilities with a UHF return channel, which ticks a lot of boxes. AEON-CC will still handle quad 3G, dual 6G, and native 12G formats. We also created AEON-Lite, the lightest and smallest 4K encoder/transmitter currently on the market. It retains a streamlined yet robust feature set and RF path, including a simplified 4K and Quad-HD link. In short, AEON has 4K covered.